In March, the total non-farm payroll increased by 196,000 while the unemployment rate remained unchanged at 3.8 percent. The major gainers were in the field of health care and people employed in technical and professional services. While the unemployment rate remains unchanged at 3.8 percent, the number of people unemployed was 6.2 million. 1.3 million of the population are jobless for 27 weeks or more and this accounts for 21.1 percent of the unemployed. At 63 percent, the labor force participation rate was little changed over the past 12 months. 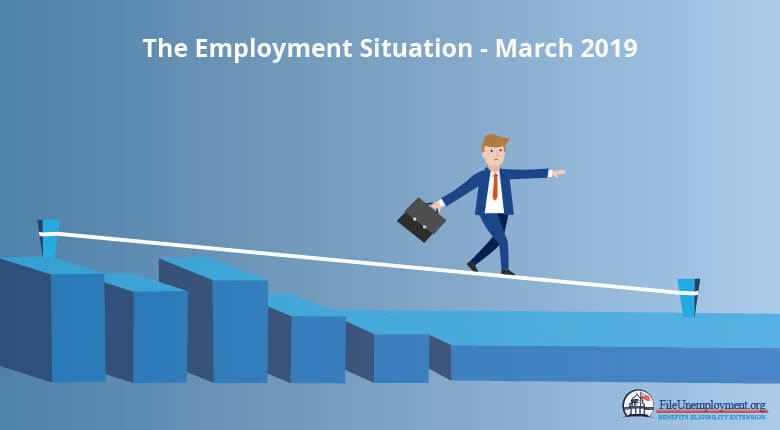 The employment-population ratio was 60.6 percent in March and has been either 60.6 percent or 60.7 percent since October 2018. Part time employed people was little changed at 4.5 million in March. These individuals would have preferred full-time employment were working part time because their hours were reduced or there were no more full-time jobs. 1.4 million people were attached to the labor force which is slightly different from a year earlier. These individuals were not part of the labor force, were ready to work and have looked for jobs for the last 12 months. In March, there were 412,000 discouraged workers in March which remained unchanged from a year earlier. Discouraged workers are people that are not looking for work as they believe that there are no jobs in the market for them. While the remaining 944,000 people marginally attached to the labor force had not searched for work for reasons like family responsibilities and school attendance. As discussed earlier, the total non-farm payroll employment increased by 196,000 in March. It saw notable gains in health care and in technical and professional services. 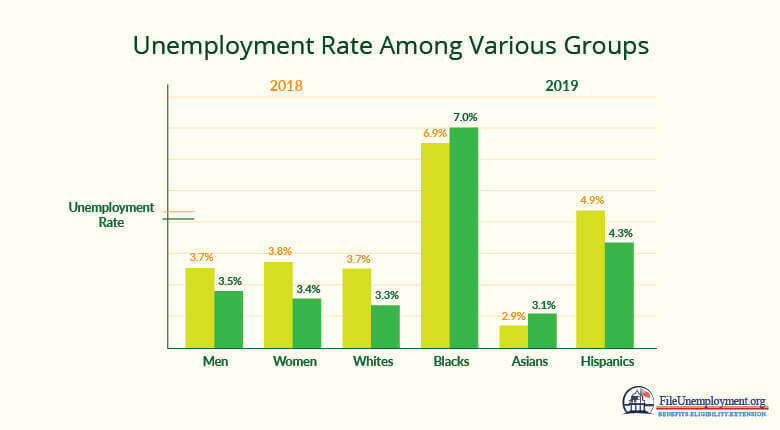 The employment growth averaged 180,000 per month during the first quarter of 2019 as compared to 223,000 per month in 2018. The Health Care industry added 49,000 jobs in March and 398,000 over the last 12 months. In March, the employment in ambulatory health care services increased by 27,000, hospitals by 14,000 and nursing and residential care facilities by 9,000. Technical and professional employment grew by 34,000 in the month of March and 311,000 over the past 12 months. At the same time, computer systems design and related services added 12,000 jobs. 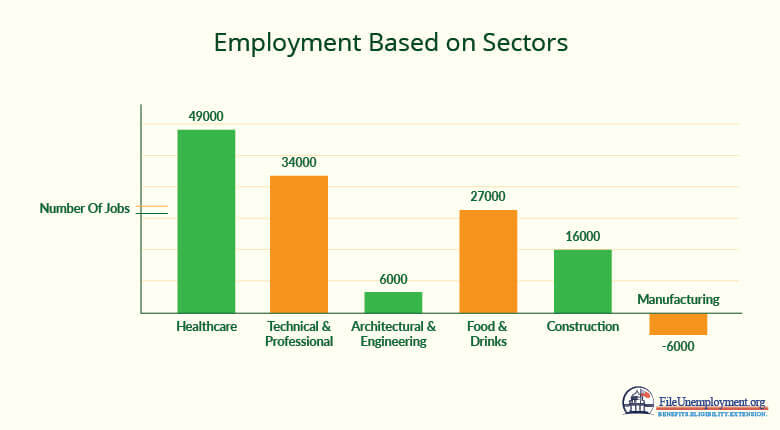 While architectural and engineering jobs increased by 6,000 and technical and management jobs increased by 6,000. The employment in drinking places and food services had an upward trend of 27,000 with an average monthly again over 12 months. Construction employment showed little change in March to 16,000 but increased by 246,000 over the past 12 months. Manufacturing employment decreased by 6,000 in March following an increase of 1,000 in February. In the 12 months prior to February, manufacturing had added an average of 22,000 jobs every month. But in the motor vehicle and parts industry, it declined by 6,000 in March. There are major industries which include mining, retail and wholesale trade, warehousing, transportation, financial activities, government and information sectors which showed a small change over the month. The average workweek for employees on private non-farm payrolls increased by 0.1 hour to 34.5 hours in March. The manufacturing workweek remained unchanged at 40.7 hours and the production and non supervisory employees increased by 0.1 hour to 33.7 hours. In the month of March, the average hourly earnings on private non-farm payrolls rose by 4 cents to $27.7 and increased 3.2 percent in the last 12 months. Similarly, the average hourly earnings increased by 3.2 percent and the average earnings of the private sector production and non supervisory employees increased by 6 cents to $23.24 in March. The total change in non-farm payroll employment from January was revised up from 311,000 to 312,000 and the change in February was revised from 20,000 to 33,000. Based on these revisions, employment gains in January and February were 14,000 more. After revisions, job gains average 180,000 per month over the last 3 months. The total nonfarm payroll employment in February changed a little by 20,000 as compared to January. The unemployment rate has decreased to 3.8 percent. 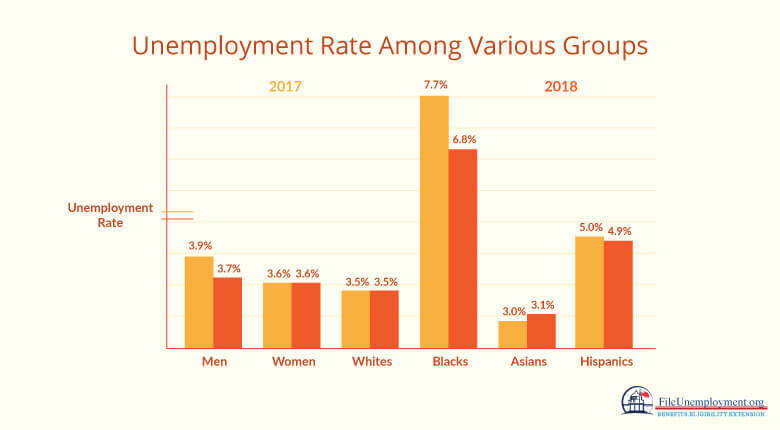 The main reason for improvement in unemployment rate is based on professional and business services, wholesale trade, health care that saw a trend up while construction employment decreased. 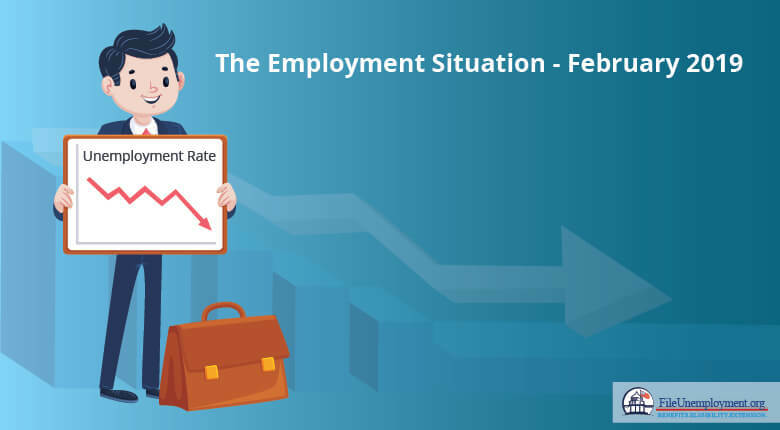 The overall unemployment rate declined by 0.2 percentage point to 3.8 percent in February while number of unemployed people decreased by 300,000 to 6.2 million. Those that lost their jobs and completed temporary jobs declined by 225,000. The decline could be based on the return of federal workers to work that were furloughed in January due to the partial government shutdown. 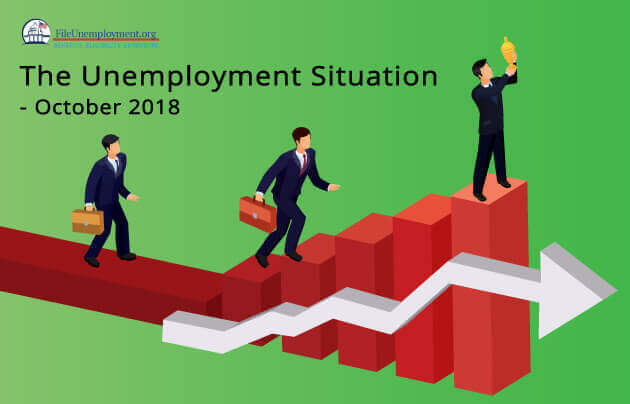 Looking at the unemployment of various groups, you can get an understanding of unemployment situation based on how it has fared in the same month in the previous year. People that were long-term unemployed remained unchanged at 1.3 million and accounted for 20.4 percent of the total unemployed. The labor force participation has changed a little over a year with a rate at 63.2 percent. Similarly, the employment-population ratio was at 60.7 percent. This remained unchanged over the month as it was up by 0.3 percentage points over last year. Based on economic reasons, the number of people employed part time decreased by 837,000 to 4.3 million in February. This decline follows a sharp increase in January which was a result of the federal government shutdown. Also in February, 1.4 million people were marginally attached to the labor force and this decreased by 178,000 since the previous year. These individuals were not part of the labor force, were available to work and were actively looking for a job in the past 12 months. Another group were the 428,000 discouraged workers in February which changed very slightly from the previous year. While the remaining 1 million people marginally attached to the labor force had not searched for work due to reasons like family responsibilities and school attendance. While the total nonfarm payroll employment remained little changed of 20,000 after increasing by 311,000 in January. Similarly, in 2018 it average at 223,000 per month. But in February the main sources of employment were in professional and business services, wholesale trade and health care. But at the same time employment of construction declined. The professional and business services continued to edge up at 42,000 with its average monthly gain of 12 months. Health care added 21,000 jobs with over 361,000 jobs added over the year. Even employment in the ambulatory health care services increased by 16,000. The wholesale trade employment has an upward trend of 11,000. The industry added 95,000 jobs over the year which is largely among the durable goods wholesalers. But in February, construction employment declined by 31,000 which was due to a partial offset of an increase of 53,000 jobs in January. The main employment in construction declined in heavy and civil engineering construction was 13,000. But over the year, construction added 223,000 jobs. Similarly, manufacturing employment changed little in February to 4,000 after an increase of 22,000 per month. The month of February saw that the employment in the leisure and hospitality industry remained unchanged after it posted job gains of 89,000 and 65,000 in January and December. Over the year, it has added 410,000 jobs. There was little or no change in major industries like retail trade, mining, transportation, warehousing, financial activities and government. In January, the total nonfarm payroll employment increased by 304,000 as compared to December which had an increase of 312,000 jobs. The unemployment rate has increased from 3.7 percent to 4 percent and this could be attributed to the Shutdown which lasted for 35 days from December 22, 2018, until January 25, 2019. There has been a 0.3 percent increase in the unemployment rate and the number of people unemployed now stands at 6.5 million. 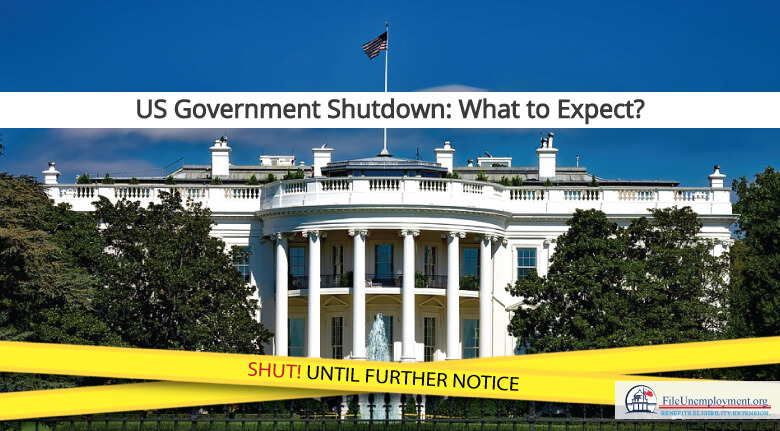 Those that were impacted due to the partial federal government shutdown were reported as being on temporary layoff which has increased by 175,000. This figure includes those that were furloughed federal employees that were classified as unemployed during the temporary layoff. When it comes to determining the unemployment of various groups, you can get a fair understanding of how the country has fared during the same period, in the previous year. There was a little change in the number of long-term unemployed at 1.3 million and this accounted for 19.3 percent of unemployed individuals. The labor force participation rate was at 63.2 percent and the employment to population ratio is at 60.7 percent. These measures are up 0.5 percent over the year. Another important mention is that the number of people employed part-time has increased by one-half million to 5.1 million in January. Also, in January, 1.6 million people were marginally attached to the labor force which was unchanged from a year earlier. There were 426,000 discouraged workers in January and the remaining 1.2 million people were marginally attached to the labor force had not searched for work because of school attendance and family responsibilities. The nonfarm payroll employment increased by 304,000 in January as compared to the average monthly gain of 223,000 in 2018. While in January, the employment grew in several industries like warehousing, transportation, construction, health care, and hospitality. There are no discernible impacts of the partial federal government shutdown for estimates based on earnings, hours or employment. The employment rose in the hospitality and leisure by 74,000 while the job gains were mostly from food services and drinking places (37,000) and amusements, recreation and gambling which increased by 32000. Over the past year, leisure and hospitality alone added 410,000 jobs. Another major contributor to job gains is through the special trade contractors which increased in both nonresidential (19,000) and residential components (15,000). Employment rose in the heavy and civil engineering construction by 10,000 and residential building by 9,000. In the past 12 months, 338,000 jobs were added in the construction sector. In the health care industry, employment increased by 42,000 while the largest contributors were ambulatory health care services (22,000) and hospitals (19,000). Health care added 368,000 jobs over the past year and over the month, employment in transportation and warehousing rose by 27,000. Retail trade employment edged up by 21,000 while general merchandise stores lost 12,000 jobs. The mining industry has added 64,000 jobs over the year as the employment increased by 7,000 in January. Professional and business services continue to trend up over the month and it has increased by 546,000 in the last 12 months. Manufacturing has seen an uptrend with 261,000 jobs being added over the year. There has been an increase of 20,000 jobs in durable goods while there is a decline of 7,000 in non-durable goods. When it comes to employment in the Federal government, it has remained unchanged in January with an increase in 1,000 jobs. Federal employees on furlough during the partial government shutdown were counted as employed because they worked or received pay for the period that included 12th of the month. The total nonfarm payroll employment for November was revised from 176,000 to 196,000 and the change for December was revised from 312,000 to 222,000. Based on these revisions, the employment gains in November and December combined were 70,000 more. This makes the job gains an average of 241,000 per month over the past three months. 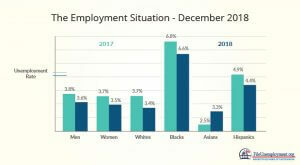 This suggests that though there has been an increase in the number of jobs in several industries, the main job gainers in the industry were leisure and hospitality, construction, health care, and transportation and warehousing. The US government has been in partial shutdown since December 22, 2018, as President Trump continues to demand more than $5 billion for the border wall between US and Mexico. At this time, since the Democrats control the House, they continue to suggest that they won’t agree to any new money for the wall. Though Trump would not declare a state of national emergency, the White House has already started the groundwork in the event that a major problem arises. Till date, this is the longest shutdown in the history of America. What Does This Shutdown Mean? This partial government shutdown would lead to a serious impact on the 800,000 federal employees including the essential jobs that are required to work without pay. This would suggest that most government offices and national monuments would not be functional. As of now, it is difficult to predict layoffs or companies closing down or seeing companies slash up to one-third of its staff due to mergers and acquisitions. President Trump stated that he would not relent till the Democrats come to an understand and would go to the extent of using even Disaster Relief Funds to ensure that he has enough financial backing to complete the Wall. Owing to this, President Trump suggested that he would even militarize the border and improve the border security to safeguard the American people. What to Expect With the Government Shutdown? Currently, the Federal Government gets its funding from the annual budget appropriations that is governed by the Congress. While the majority of the government has funding in place since the budget was initiated on October 1, 2018, there are still agencies that are operating on temporary extensions which expired at midnight on December 21, 2018. Workers are in a fix as funding was not enacted for those agencies during the shutdown. This leaves several employees working for those agencies that have stayed on the job even with furloughs. In both cases, these employees will remain unpaid until the spending authority is restored. Those that remain at work are called Excepted while those that are furloughed are called Non-excepted. In this period individual agencies would help make decisions in what the government calls Contingency Plans. How to Survive a Government Shutdown? The best way to prepare for this kind of crisis is to have a Financial Fire Drill (FFD) in place. This FFD is a focused look at essential expenses and how you would be able to cover them during a no-work period. This includes a list of resources and the answer to all the what-ifs. This is where you should prepare yourself on how to answer an interview. How Much Should You Save to Be in the Clear? When you come to think about it, you should try to be financially secure to ensure that when push comes to shove, you have enough resources for you and your family. This actually is quite liberating as you can learn to get by on $1,000 a month till things get better. You should try to develop a habit of saving and if you have, then your healthy emergency fund can be used for an occasion like this one. While it is suggested that you save for three to six months’ worth of expenses, it would be advisable to save for a year’s worth. Though in theory, it could be difficult, it can be made possible. Though the main point would be to save on the emergency fund and spend it. There are cases of emergencies where you cannot be fully covered. Also, if it takes more than three months to find a new job or recover from a health issue then you still have to pay the bills and this emergency fund would come in handy. Similarly, you should learn to perform better at work and learn new skills while on the job to ensure that you are up to date with the current state of affairs. If you are among the 800,000 federal employees or among the many that have lost their job or have furloughed your work then you can apply for unemployment benefits. How do you apply for benefits, you ask? Firstly, you will have to apply online to WorkForce West Virginia website or visit the nearest WorkForce office for help. Secondly, submit the Notification of Personnel Action (SFSO) or a Notice to Federal Employee About Unemployment Insurance (SF8). Thirdly, as furloughed federal employees, you should upload past check stubs to the application to expedite the process. Though furloughed federal employees are not required to seek employment to receive benefits, they would be expected to reach an agreement with Congress to back pay once the shutdown has ended. If you are in a tight spot and need help to find employment then you should take a look at some of our resources in order to ensure that you are well on your way. You also need to figure out how you can get hired after a career break, we have the right resources to help you on your way. Don’t forget to use our host of tools like the Base Period Calculator, Benefits Calculator, and the Eligibility Calculator to help determine your benefits amount that you should receive. This way you can figure out what your base period is, determine the benefits that you are due and whether you are officially eligible to claim your benefits. With the Base Period Calculator, you can determine what your base period which is the months prior to losing your job. These are the usually the first four of the last five completed calendar quarters prior to the effective date of the claim/unemployment. Similarly, you can use the Benefits Calculator to determine what is the amount of benefits that you are due based on your base period. But before you determine your benefits, you should check out the Eligibility Calculator to know whether you are eligible for benefits and if you are actively searching for a job. If you have any questions about how to use these tools or need any information about how to get your benefits then you can reach out to us in the comments section below. Don’t feel shy, we’re all ears! Total employment in the non-farm category increased by 155,000 for the month of November. The rate of employment has remained unchanged at 3.7%, as per the reports of the U.S. Bureau of Labor Statistics. The report also states that sectors such as healthcare, manufacturing, transportation, and warehousing have recorded job gains. The rate of unemployment remained unchanged for the third month in a row at 3.7%, and the number of unemployed persons changed marginally standing at 6 million. In the course of the year, however, the number of people unemployed and the rate of unemployment declined by 641,000 and 0.40% percentage point respectively. The above data indicate that there are little to no changes in comparison to the previous month. The rates of labor force participation and the employment-population ratio, remain unchanged at 62.9 percent and 60.06 percent. The numbers of persons employed part time for economic reasons, however, changed a little, standing at 4.8 million. The number of long-term unemployed (those jobless for 27 weeks or more) has come down by 120,000, with the overall figure now standing at 1.3 million for November. This group accounted for 20.8% of the overall rate unemployment rate. These involuntary part-time workers seek full-time employment but end up with part-time jobs because of either their due to the reduction in their working hours or due to the inability to find full-time job opportunities. In November, 1.7 million people were marginally attached to the labor force, which is said to be an increase of 197,000 from the previous year. These people were not in the labour force in the previous year and were not counted as unemployed as they did not make an attempt to find employment. Among the marginally attached, it is said that 453,000 people are identified as discouraged workers. Discouraged workers do not look for work in the current scenario as they believe that there are no jobs available for them. The other 1.2 million people are marginally attached to the labor force, as they have not looked for work due to commitments such as school attendance or family responsibilities. In November, the total non-farm payroll employment increased by 155,000, which is lesser than the average monthly gain in the previous 12 months, which stands at 209,000. Healthcare, manufacturing, transportation, and warehousing sectors were some of the areas that witnessed job gains in the given month. The healthcare sector added 32,000 jobs in November. Within the industry, employment growth occurred in ambulatory healthcare services, adding 19,000 jobs and hospitals adding 13,000 jobs. Over the year, the healthcare sector has added 328,000 jobs. The manufacturing sector has added 27,000 jobs, with chemicals and primary metals adding 6,000 and 3,000 jobs respectively, in November. Overall, the manufacturing sector has added 288,000 jobs in the course of the year, largely in durable goods industries. Transportation and warehousing sector has reportedly added 25,000 jobs in November. Within the industry, growth occurred in couriers and messengers, adding 10,000 jobs and warehousing and storage, adding 6,000 jobs. Over the year, this sector has added 192,000 jobs. Other industries that have experienced job growth in November include professional and business services, which added 32,000 jobs, retail trade added 18000 jobs, merchandise stores added 39,000 jobs and miscellaneous store retailers added 10,000 jobs. 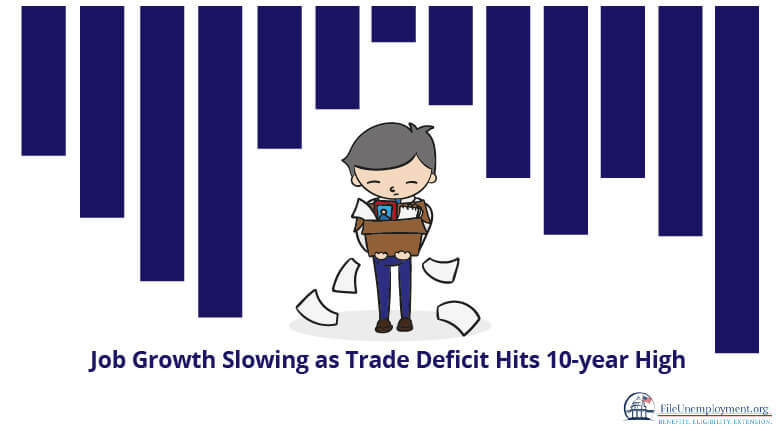 There were also industries that recorded a decline in job growth, such as the clothing and cloth accessories industries lost 14,000 jobs, electronics and appliance stores lost 11,000 jobs and sports, books and hobby stores lost 11,000 jobs. The drop in soybean exports and the record high increase in imports of consumer goods has created a US trade deficit which is at a 10-year high. This would mean that the Trump administration’s tariff-related measures to reduce the trade gap have been ineffective. New data suggests that private employers hired fewer workers than expected in November and this points to the moderation in the pace of the job growth. This was reinforced by yet another report that showed a decline in the number of Americans filing claims for unemployment benefits. The report maintains that weak housing and business spending on equipment data signals a slowdown in economic growth. There have been concerns over the health of the economy that has upset the financial markets in the last few days. Also, the Commerce Department suggested that the trade deficit has increased by 1.7% to $55.5 billion, the highest its ever been since October 2008. This trade gap has widened for 5 straight months. Revised data show that there is a deficit rising to $54.6 billion instead of the previously reported $54 billion. Similarly, the politically sensitive goods trade deficit with China has surged 7.1% to record $43.1 billion in October. There is a bitter trade war which is brewing between the United States and China. There are imposed tariffs on $250 billion worth of Chinese imports to force concession on the list of demands that would change the terms of trade between the two countries. China has now created new import tariffs on US goods in response. President Trump accuses Beijing of not playing fairly on trade. Additionally, to the Chinese goods, Washington was slapped with tariffs on steel and aluminum imports into the United States. While President Trump and President Xi Jinping agreed to hold off on imposing more tariffs for 90 days while they negotiate a deal to end this trade dispute. After the arrest of Meng Wanzhou, CFO of Huawei Technologies and the daughter of its founder, this truce seems to be in jeopardy. The overall trade deficit is forecast to rise to $55 billion in October. When it is adjusted for inflation, the good trade deficit was increased to $87.9 billion in October from $87.2 billion in September. This so-called real trade deficit above the average for the third quarter. Trade subtracted 1.91 percentage points from GDP growth in the July-September quarter. Growth estimates for the fourth quarter are at 2.8% annualized rate. But owing to this, the economy still grew at a 3.5% pace in the third quarter. But US stocks are trading sharply after Wanzhou’s arrest which has sparked fears between the Sino-US tensions. Also, the prices of the US Treasuries were trading higher while the dollar was weaker against several other currencies. Also, in October, exports of goods and services slipped by 0.1% to $211 billion. China has targeted the Soybean exports in the trade dispute and this has been dropping for the last several months and fell $0.8 billion. Exports of civilian aircraft and engines also fell. Additionally, exports of petroleum and consumer goods were the highest on record. A strong dollar is probably restraining the overall export growth. With the trade deficit reaching an all-time high, this would mean that imports would have sky-rocketed. Imports of goods and services rose by 0.2 percent to $266.5 billion which is an all-time high. Consumer goods imports increased by $2 billion to a record high of $57.4 billion and were boosted by a $1.5 billion increase in imports of pharmaceutical preparations. Another item that reached its highest record is motor vehicles as were other imports of goods. Imports are driven by high domestic demand as well as the strong dollar which is making the prices of imported goods cheaper and this offsets the impact of the tariffs. At the same time, the ADP National Employment Report showed private payrolls rose by 179,000 jobs in November after the downwardly revised increase of 225,000 in October. The forecasts show that private payrolls advanced 195,000 last month following a previously reported 227,000 increase in October. 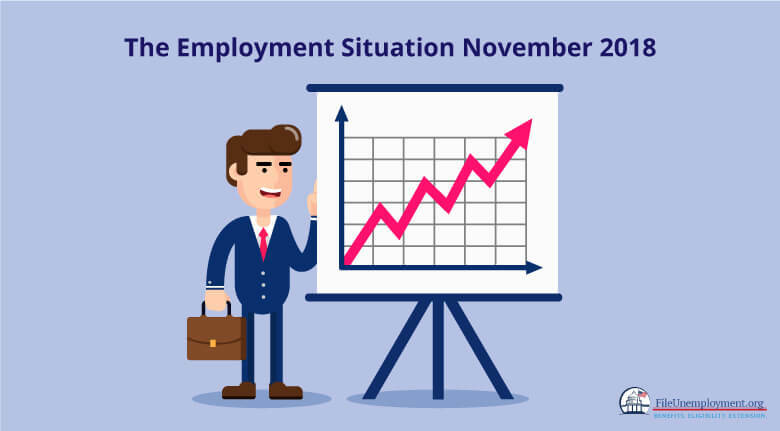 This ADP report which was jointly developed with the help of Moody’s Analytics published ahead of the government’s more comprehensive employment report for November which is scheduled for release on Friday. Nonfarm payrolls are likely increased by 200,000 in November after surging by 250,000 in October. The unemployment rate is forecast holding steady at half a century low of 3.7%. Though the ADP report is a record that predicts the private payrolls component of the government’s employment report, job growth looks like its slowing. The main reason for this is due to the shortage of qualified workers. In its third report, the Labor Department expressed that the initial claims for the state unemployment benefits dropped 4,000 to seasonally adjusted 231,000 for the week ended Dec. 1. Even though claims have fallen to 225,000 in the latest week, claims have risen for three straight weeks touching an eight-month high of 235,000 during the week ending November 24. This is a reason to believe that the labor market has reached its peak. While job layoffs have increased, there is an uncertainty over facing tariffs and the stock market turbulence may have to be dented confidence as well, for companies that are trimming their staff. The fourth report by the Institute for Supply Management (ISM) expressed that its non-manufacturing activity index rose 0.4 points to a reading last month of 60.7. Any reading above 50 indicates expansion in the sector which accounts for more than two-thirds of activity in the US economy. But this time around, the ISM’s employment measure fell 1.3 points last month with employers in the construction industry reporting difficulties finding workers due to lack of qualified talent. Only time will tell if job growth would be triggered by policy-making and the change in trend in the job market. 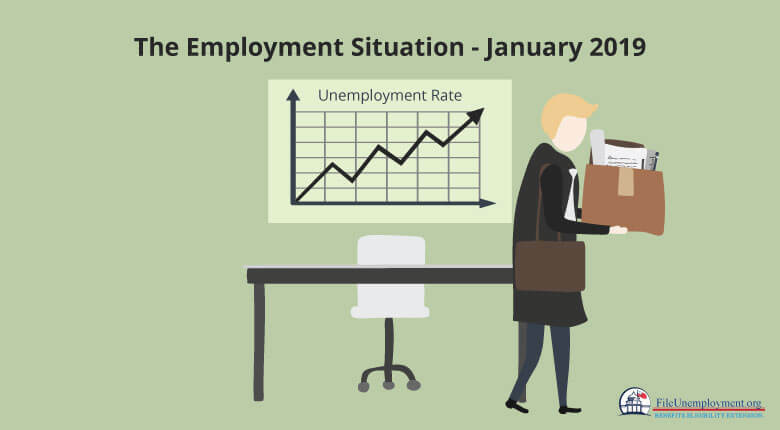 You can read more about the unemployment situation in the US and stay updated. The unemployment rate in the United States remained at 3.7 percent in the month of October and the number of unemployed persons changed a little at 6.1 million. Over the year, the unemployment rate and the number of unemployed persons declined by 0.4 percentage point and 449,000, respectively. The number of long-term unemployed (those jobless for 27 weeks or more) was essentially unchanged at 1.4 million in October and accounted for 22.5 percent of the unemployed. The labor force participation rate increased by 0.2 percentage point to 62.9 percent in October but has shown little change over the year. The employment-population ratio edged up by 0.2 percentage point to 60.6 percent in October and has increased by 0.4 percentage point over the year. time because their hours had been reduced or they were unable to find full-time jobs. sometime in the prior 12 months. They were not counted as unemployed because they had not searched for work in the 4 weeks preceding the survey. Total nonfarm payroll employment increased by 250,000 in October, following an average monthly gain of 211,000 over the prior 12 months. In October, job growth occurred in health care, in manufacturing, in construction, and in transportation and warehousing. Health care added 36,000 jobs in October. Within the industry, employment growth occurred in hospitals (+13,000) and in nursing and residential care facilities (+8,000). Employment in ambulatory health care services continued to trend up (+14,000). Over the past 12 months, health care employment grew by 323,000. Construction employment rose by 30,000 in October, with nearly half of the gain occurring among residential specialty trade contractors (+14,000). Over the year, construction has added 330,000 jobs. gain in the industry for the 12-month period prior to September. (+35,000). Over the year, the industry has added 516,000 jobs. Employment in mining also continued to trend up over the month (+5,000). The industry has added 65,000 jobs over the year, with most of the gain in support activities for mining. Employment in other major industries–including wholesale trade, retail trade, information, financial activities, and government-showed little change over the month. Iowa’s unemployment has dropped to 2.5 percent and this makes it the second lowest in the country after Hawaii. But 50 percent of Iowa graduates still prefer to move out of the state once they are done with college. Iowa’s unemployment rate has fallen to the lowest percentage since 2000. There is a low unemployment rate for Iowa as compared to the rest of the United States. Also, the job openings in the state are greater than the number of workers seeking jobs. Iowa has a historically low unemployment rate. Whether it’s good or bad is based on whether you’re a firm or a worker. If you’re a worker and there is a lot of jobs then it is always a good thing. But for a firm, it could be difficult for them to find the right candidates to match these jobs. Iowa’s economy has done better than most states and unemployment remained low during the Great Recession. The Federal Reserve for Economic Data shows that there was a recession in 2007 and Iowa’s unemployment was approximately 6.7. This is lower than the US unemployment rate which is approximately 10 percent. Also, in most cases, vehicles can be expensive for most people that work in the rural economy. There are a large number of skilled workers that qualify to work on certain types of jobs and may feel the need to move in order to be in places where their skill sets are in demand. Based on the effect of the low unemployment rate, professional organizations are coming in and engaging with students through classroom level activities to try to build relationships with them. Research conducted by the UI during the academic year 2016-17 was 50.25 percent of graduate students employed in Iowa and 23.07 percent employed in Illinois. There are several students that come from different states and live in Iowa and find opportunities and this encourages them to stay in the state. Iowa students prefer to move out and the most prominent reason is to live in a metropolitan area. Most people prefer going to states with a lower cost of living like Texas. Also, there are areas that attract people with certain interests. It’s not since May of 2000 that Iowa’s unemployment has been this low. Iowans are coming together to help more Iowans find work and get upskilled based on their community of 2,100 and business leaders. While the number of unemployed Iowans has decreased to 44,000 in July from 44,900 in June, this is a positive trend. The current estimate shows are lower by 8,100 than a year ago where the level of 52,100. The total number of working Iowans increased to 1,640,300 in July which is 5200 higher than June and 13200 higher than a year ago. The total nonfarm employment decreased by 700 in July which is lowering the total down to 1,591,500 jobs in the market. Accounting to this would mean that there is a small loss is the third of 2018 which follows the surge in hiring over the last two months. Goods-producing sectors have together added jobs for the sixth-consecutive month stretching back to January. At the same time service industries shed 2,300 jobs following large gains over the past two months. At the same time, private industries as a whole experienced no change since June while the government shed 700 jobs which is up against the 400 jobs annually. The retail industry shed the most jobs in July which is about 3000 and was responsible for all of the loss in the trade and transportation sector which lost 2,100 jobs. This decline was expected given the recent announcements of stores closing around the state. For the most part, retail has trended down since the beginning of 2017. This trend should continue through 2018 as online sales continue to gain popularity around the nation. In the education services and healthcare sector, this was the only major loss this month due to small losses in each segment. This sector is expected to trend back up during the second half of the year. Similarly, the manufacturing sector had the biggest job gains with an increase of 1,300 jobs and this would follow another moderate gain of 900 in June. Financial services added 600 jobs in July and it continues to expand its footprint in the Iowa economy. Similarly, there were 600 jobs gained in the leisure and hospitality industry. This sector has been increasing staffing levels since the fourth quarter of last year and gains have been the heaviest within the food services and accommodations. Construction has seen a small gain of 300 jobs this month which is the sixth consecutive month of growth. There have been 19,000 jobs gained since last July and most of these gains occurred within Iowa’s factories which accounts for 11,300 jobs. The durable goods shops have outpaced the non-durable goods counterparts in terms of growth which is 7900 jobs versus 3400 jobs. Construction industries are up by 3,500 jobs annually following job gains which stretched back to January. Additionally, the finance sector has continued to fair well by adding 2900 jobs. While the private sector has lost 2600 jobs and so is the trade and transportation industry by 2200 jobs. If you are unemployed then you should use the resources and research on FileUnemployment.org to connect with your local unemployment offices and search your unemployment claim. You can determine how to go about your claim based on the application process, eligibility calculator, job search requirements and more. You can find out what are the type of unemployment benefits that you can claim based on the state. Here you can choose your state and connect with an office close to you. Americans filing for unemployment benefits unexpectedly rose but remained near a 49 year low. This increase appeared unlikely to make a dent in the US labor market which remains strong. The claims for state unemployment benefits increased by 7,000 and adjusted to 214,000 for the week. Earlier, economists suggested that the claims forecast was slipping to 206,000 from 207,000. The labor market is viewed as being near or at full employment, which many economists believe is helping U.S. wages grow a little more quickly and fueling expectations the Federal Reserve will increase interest rates again in December. This year alone, the Fed has already raised rates three times. The claim report expressed that the number of people receiving benefits after the initial week of aid rose 4,000 to 1.66 million for the week ended September 29. The four weeks moving average of the so-called continued claims which has decreased 10,000 to 1.66 million to the lowest level since August 1973. People seeking help with lost wages from Florence has surpassed Matthew. This is nearly 9300 North Carolinians that have applied for disaster-related unemployment benefits due to Hurricane Florence. Many of these people which is nearly 8000 have applied for disaster unemployment assistance which is an additional benefit for those that are left without wages due to the storm. This is nearly four times the number of people that requested for disaster unemployment assistance after Hurricane Matthew in 2016. There are several in Eastern North Carolina that have not resulted in several days and weeks without pay. These are hourly workers, self-employed workers, fishermen, and farmers. Most lost wages at the end of the month especially when they have to make payments for mortgage, rent or electricity. The state has made payments of more than $300,000 in claims and this could easily pay out several million. After Hurricane Matthew, payouts reached more than $2.8 million for storm-related unemployment claims. There were more than 7545 applications for regular unemployment and around 2200 for DUA after the storm. Hurricane Florence had a much larger impact on metropolitan areas, such as Wilmington, Jacksonville, and New Bern, while Hurricane Matthew hit more rural areas. 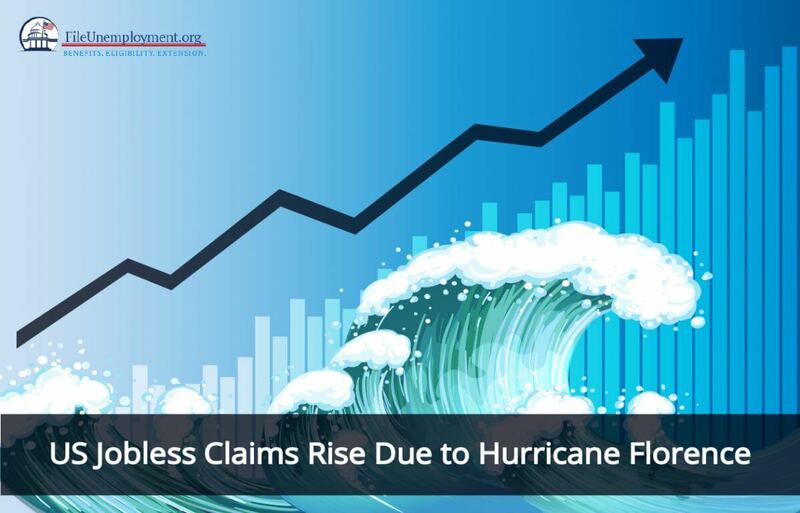 The storm hit areas which have a higher labor market which means greater claims numbers. Disaster unemployment assistance is available to people who live in one of the 28 counties approved for a federal disaster. This is for residents that cannot work as the roads are flooded, power outages and damage to the building are constraints to their work. It also helps those who are ineligible for standard unemployment insurance recoup some of those lost wages from the storm. People may not be eligible for regular unemployment benefits because they’ve already used their 12-week allotment for the year or because they haven’t been in their job long enough to qualify for benefits. However, workers should apply for standard unemployment as well as DUA. While standard unemployment benefits pay up to $350 a week for 12 weeks, DUA pays up to $350 a week for up to 27 weeks. The Division of Employment Security has been busy since Florence hit North Carolina with all employees helping process claims. In Onslow County, the DES used the Division of Workforce Solutions’ only bus to make a mobile computer lab to process applications. Scotland County which has the state’s largest unemployment rate at 7.6 percent had the state’s NC Works office handling claims in downtown Laurinburg. This area was flooded by the storm and forced workers to temporarily relocate to Scotland County’s economic development office. Most roads in Scotland County’s rural region was flooded and damaged which kept away many workers from their jobs. NC Works employees moved to Kordsa in Laurel Hill to assist with the worker’s file claims. Places like Kordsa, which employs around 100 people which manufactures nylon wiring for tires. The company’s building lost power and the roads around it flooded, causing it to halt operations for four days. If you are a worker from one of these 28 counties in Eastern North Carolina then you have been approved for federal disaster assistance. Eligible counties are: Beaufort, Bladen, Brunswick, Carteret, Columbus, Craven, Cumberland, Duplin, Greene, Harnett, Hoke, Hyde, Johnston, Jones, Lee, Lenoir, Moore, New Hanover, Onslow, Pamlico, Pender, Pitt, Richmond, Robeson, Sampson, Scotland, Wayne and Wilson.